Cristiano Ronaldo's position and playing time have evolved, and his post-playing career is looming, but he has an insatiable drive to remain the best, making for an intriguing few years ahead. Cristiano Ronaldo scored two more goals Saturday, as Real Madrid stayed atop of La Liga after beating Granada 5-0. The result extended its unbeaten run to a record 39 games. It was Ronaldo’s first match since winning the Ballon D’Or last month, and before the game he posed in front of a pitch-side table with his four Ballon trophies on it. He wore limited-edition boots called CR7 Vitorias with a gold sole-plate to commemorate the achievement. The individual awards keep coming. Monday, Ronaldo was crowned "The Best" by FIFA, an inaugural player-of-the-year prize after the governing body’s split from Ballon D’Or ownership with France Football. Coaches despair of these individual prizes, as modern-day players become fixated with winning them over league, European or international trophies. Ronaldo has encouraged this trend: individual recognition motivates him, even if he does always acknowledge the role of his teammates along the way. This might be a response to playing in the same era as Lionel Messi, or simply a function of an obsessive pushing himself to the maximum. For the Portuguese star, team titles have led to the individual ones. In 2016, Real Madrid won the Champions League and the Club World Cup, and Portugal a first European championship. Unlike many players, there is no chance of Ronaldo ending his career and wondering if he could have done more. He is still pushing himself and those around him. This year could be the last in the usual Ronaldo-Messi rivalry for the top prize. For the ninth year running, they finished first and second on the Ballon D’Or podium. But Messi is now 29 and Ronaldo turns 32 in a few weeks. Last year Neymar was third. This year it was Antoine Griezmann. These young tyros can hope to improve those positions, not like Franck Ribery and Manuel Neuer, previous podium players whose appearances were one-offs. So for how long will Ronaldo remain The Best? After he signed a new contract last fall, which runs until 2021, he said he had another 10 years left on his career. If he does so, it will be in a different position and with a renewed status to previous years. First, his position: Ronaldo has moved into a more central striking position under Zinedine Zidane. He has lost some of the pace to get him past defenders, and, more importantly, he doesn't have the energy or desire to track opposing fullbacks. 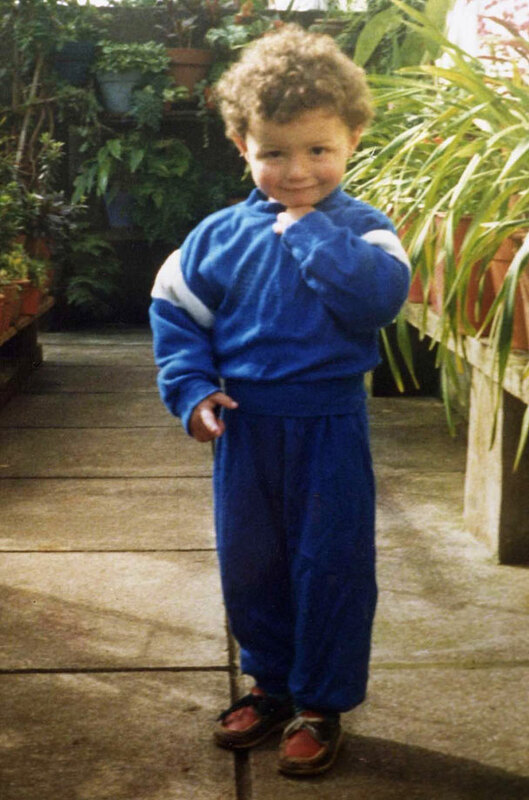 A 23-month old Cristiano Ronaldo smiles for the camera. Cristiano Ronaldo practices with Portugal U17. Cristiano Ronaldo lies injured while playing for Sporting Lisbon before his transfer to the English Premiership team Manchester United. Cristiano Ronaldo and Manchester United teammates Diego Forlan and Ruud van Nistelrooy pose with Casey Ogden during the players' annual visit to children's hospitals in Manchester. Cristiano Ronaldo attends Christina Aguilera's Back to Basics tour at the Manchester Evening News Arena. After giving Christmas gifts to a group of underprivileged children, Cristiano Ronaldo takes time to sign autographs. Cristiano Ronaldo and Bollywood actress Bipasha Basu attend the debut of the New Seven Wonders of the World at Luz stadium in Lisbon. 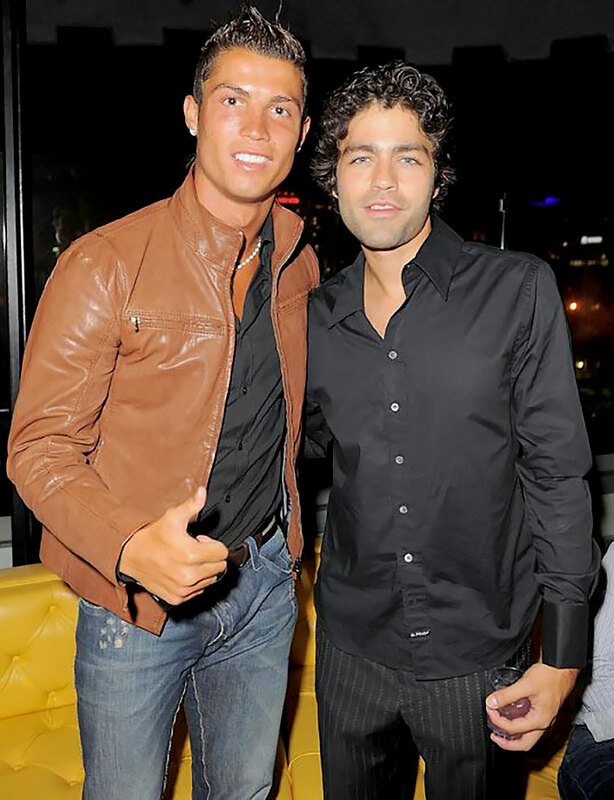 Cristiano Ronaldo and Adrian Grenier strike a pose during a party in Hollywood. Cristiano Ronaldo didn't let an injury get in the way of his beach time during a visit to Malibu. Cristiano Ronaldo with his Barclays Player of the Year, Golden Boot and 30 League Goals awards at Carrington Training Ground in Manchester, England. 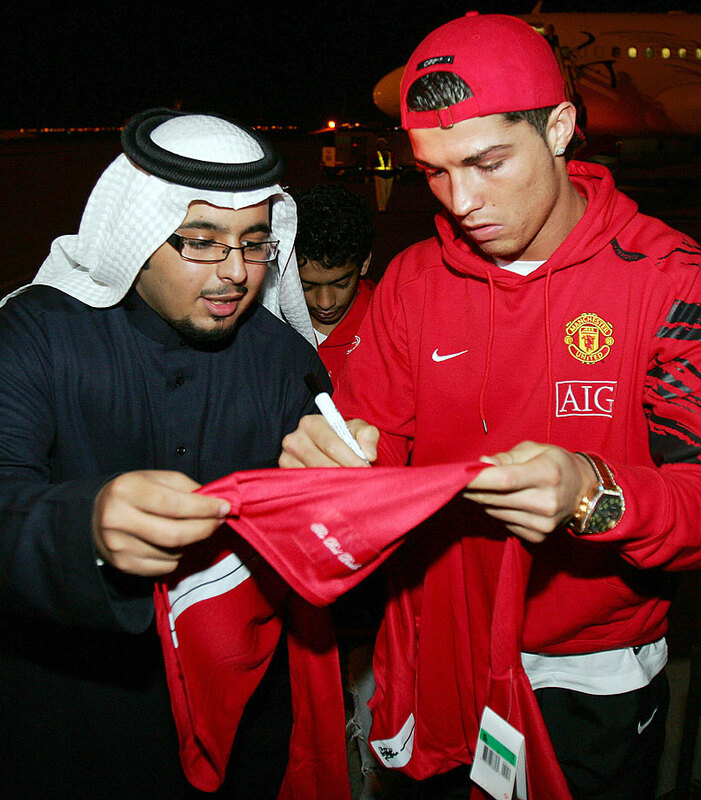 Cristiano Ronaldo autographs a team jersey for a Saudi man after arriving at King Khaled airport in Riyadh, Saudi Arabia. Cristiano Ronaldo kisses his "Golden Shoe 2008" award, presented to Europe's best goal scorer. Cristiano Ronaldo and Portuguese national teammate Aziza Makukula pose in a cockpit on their way to Zurich. WWE star Rey Mysterio with Cristiano Ronaldo as they visit Valdebebas in Madrid. 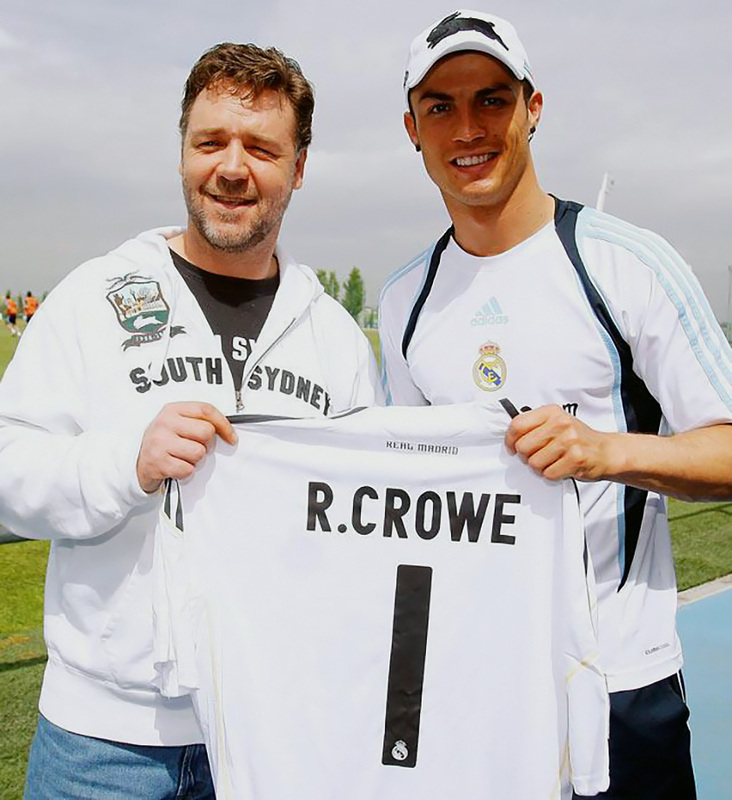 Cristiano Ronaldo with Russell Crowe during the actor's visit to Madrid. Cristiano Ronaldo and Nani celebrate in the dressing room after the Barclays Premier League match between Manchester United and Arsenal at Old Trafford in Manchester. Cristiano Ronaldo and Raul Gonzalez pose with Rafael Nadal at the Madrid Open tennis tournament. Cristiano Ronaldo leaves Da Silvano Restaurant in New York City after having lunch. Cristiano Ronaldo and girlfriend, model Irina Shayk, watch Rafael Nadal serve during a tennis match on day nine of the Mutua Madrilena Madrid Open. 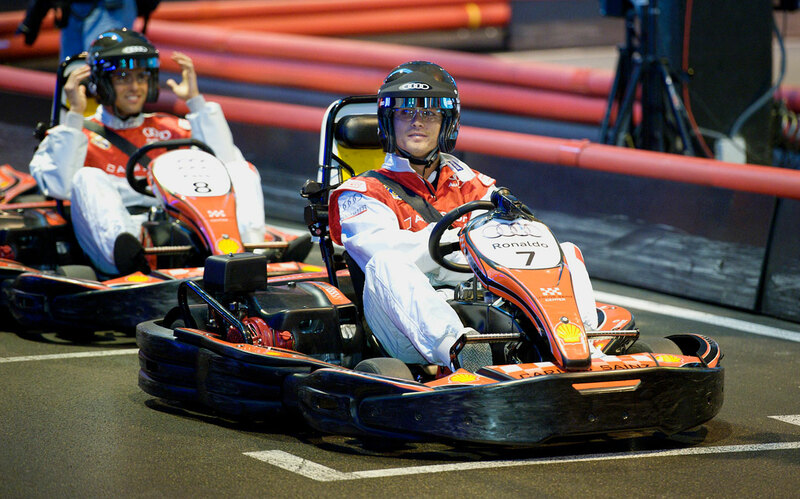 Cristiano Ronaldo participates in a kart race with his Real Madrid teammates at Carlos Sainz Center in Madrid. Cristiano Ronaldo and Irina Shayk attend the Marie Claire Prix de la Mode gala at the French Ambassador's Residence in Madrid. Cristiano Ronaldo and Irina Shayk attend the Mutua Madrid Open tennis tournament at La Caja Magica. Queen Sofia of Spain presents Real Madrid's Cristiano Ronaldo with the Ibero-American Community Trophy during the National Sports Awards ceremony at El Pardo Palace in Madrid. Cristiano Ronaldo leans in to kiss Irina Shayk as they attend the Mutua Madrid Open tennis tournament at La Caja Magica. Cristiano Ronaldo and former player David Beckham pose after a training session at UCLA Campus in Los Angeles. Real Madrid's Cristiano Ronaldo kicks around a baseball as Dodgers outfielder Yasiel Puig looks on prior to the Dodgers game against the New York Yankees at Dodger Stadium in Los Angeles. 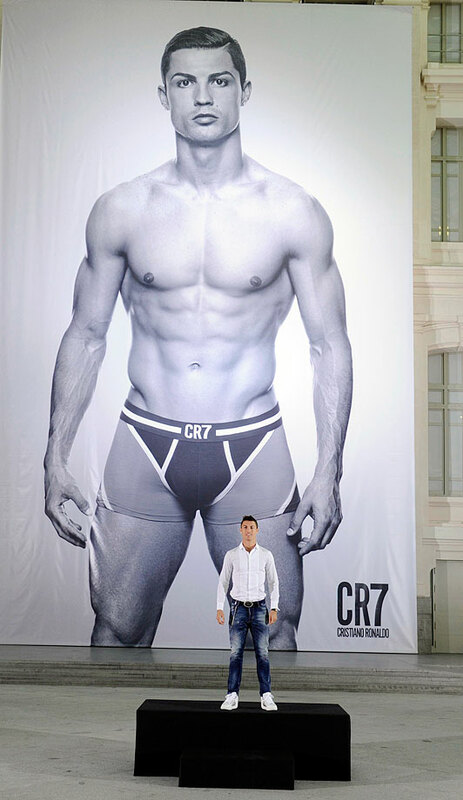 Cristiano Ronaldo launches his CR7 underwear line in Madrid. 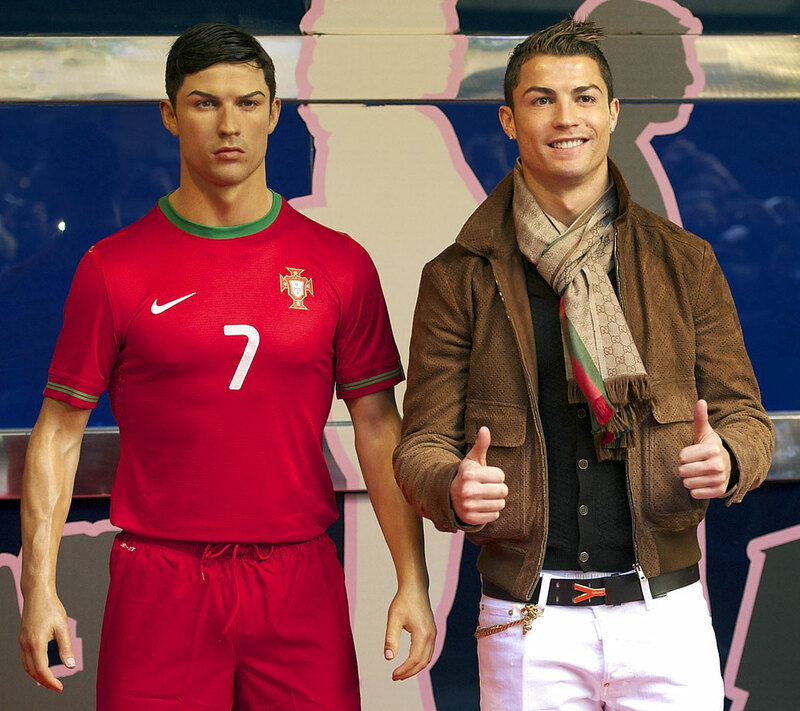 Cristiano Ronaldo attends the unveiling of his wax figure at the Museo de Cera (Wax Museum) in Madrid. 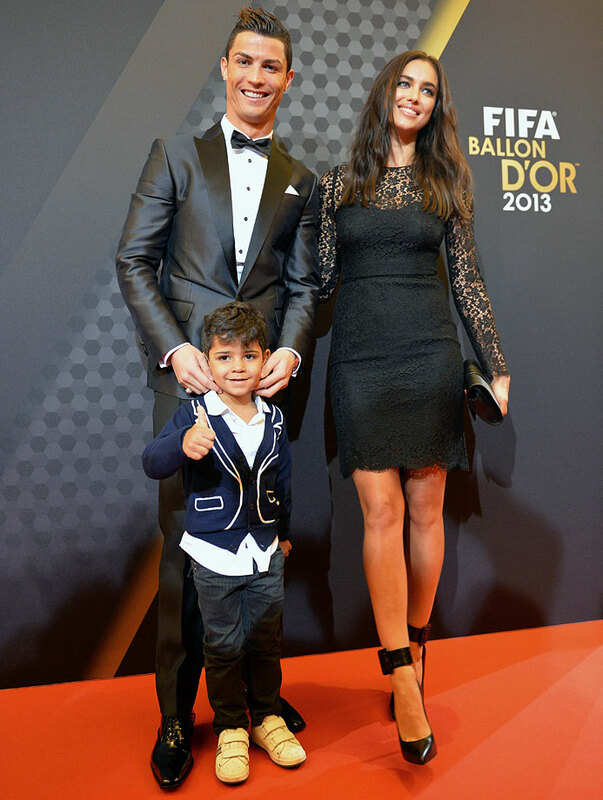 FIFA Ballon d'Or nominee Cristiano Ronaldo, his son Cristiano Ronaldo Jr., and Irina Shayk arrive at the FIFA Ballon d'Or Gala 2013 at the Kongresshaus in Zurich, Switzerland. Ronaldo won the award as FIFA top player over Lionel Messi and Franck Ribery. 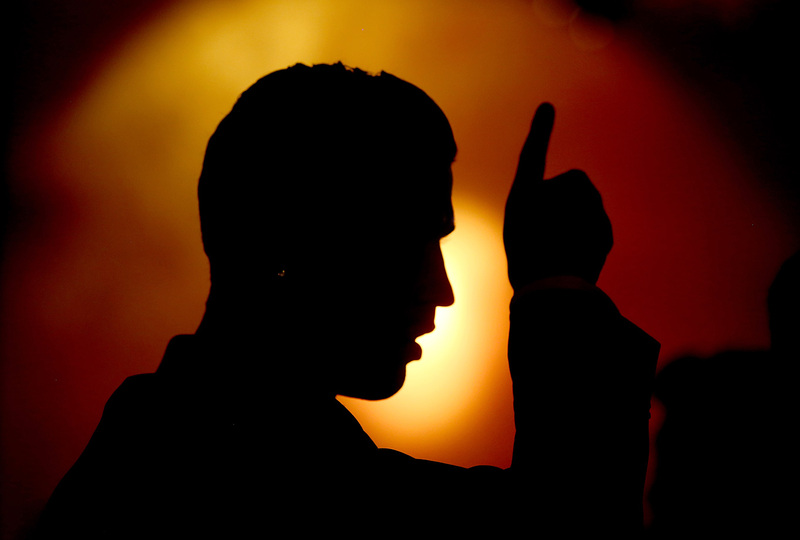 FIFA Ballon d'Or winner Cristiano Ronaldo signals during the FIFA Ballon d'Or Gala 2014 at the Kongresshaus in Zurich, Switzerland. Cristiano Ronaldo sprays his fragance 'Cristiano Ronaldo Legacy' at World Duty Free store at Barajas airport in Madrid. At a press conference before the Granada match, coach Zinedine Zidane was asked whether Ronaldo is now a center forward in his squad. The move to a No. 9 has come as no surprise in his homeland. Then there is his status: Ronaldo is no longer undroppable. Zidane, backed by a record-breaking 39-game unbeaten run and three trophies in 12 months in charge, has overseen this stage of his career with the minimum of fuss. But it is one of his most significant achievements. Ronaldo has played in 20 of Madrid's first 29 matches and has been substituted off in four of them. He has played 68% of the season so far. Compare to the last season, when he played 91% (and was subbed off twice) and the previous campaign, 87% (subbed off four times). Will dominant stretch follow Real Madrid's Champions League title? This is a new, mature Ronaldo who accepts that with his injury record (faultless until 2014 but since then there have been knocks here and there), not playing every game is key to a longer career. This seemed unthinkable only a year ago, but Ronaldo, still relentless in his ambition, gets it. He has evolved his game. He has adapted his status in the hierarchy. Will it be enough to be The Best again? How will he cope as a podium contender in face of younger challengers like Neymar, Griezmann, Gareth Bale or Pierre-Emerick Aubameyang? Or even, if they overtake him? And will he really see out his days at the Santiago Bernabeu, even if playing time, eventually, is reduced more? That cannot last forever. His agent Jorge Mendes claimed that a Chinese club had offered Madrid €300 million to buy Ronaldo but that it was rejected. There have also been links, far less lucrative, to MLS as well. This is premature: Ronaldo will not consider leaving Madrid while he is still in contention for these individual awards. Depending on the next few years, though, that might change. Last November Ronaldo signed a ‘lifetime contract’ with Nike–after Michael Jordan and LeBron James, he’s only the third athlete to do so–and so a late-career move to a market outside of Europe would help his post-football career. Ronaldo is the The Best for now. His game has changed. He accepts he is part of a rotation policy. He and his entourage are already planning for the future.